The Dan D’Agostino Master Audio Systems Progression range is designed to sit under the mighty Momentum. But, unlike most brands that make the cheaper line ‘lite’ or ‘stripped-down’, D’Agostino makes the two lines entirely different in performance! This is not something new for D’Agostino. Back in the 1980s, the two products from Dan’s drawing board that everyone wanted were either the KSA-50 or the KSA-250. The KSA-50 was the lower-powered, deceptively powerful pure Class A design, and the KSA-250 was the powerhouse. Watt for watt, the KSA-50 was considerably more expensive. Fast-forward to 2018 and the Progression Stereo delivers more power than its more upmarket Momentum Stereo counterpart. And then there’s the preamplifier. The Momentum is a more uncompromising design (balanced operation only, none of that built-in optional DAC or Bluetooth operation for the remote) and the Progression looks like the more flexible option, rather than a ‘discount design’. Progression came about because of the runaway success of Momentum. The Momentum amps became one of the most common must-have electronics for high-end and super-high-end audio systems, and those who lacked enough folding to reach Momentum levels wanted a piece of the action. Momentum Stereo came about, but this was still a lot of money for a stereo chassis, and Dan’s loyal following (many of whom stopped buying ‘the other brand’ when he left) wanted a product that could reach the attainable level. Instead, they got a whole product line, starting – like the Momentum series before it – with the power amplifiers, and recently the preamp. 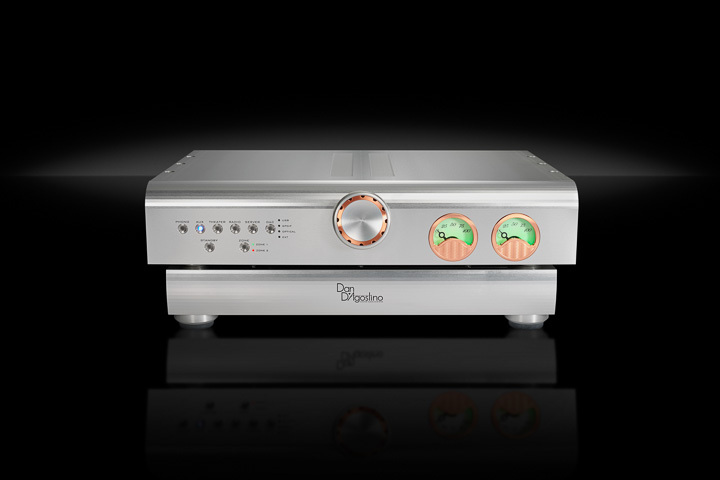 The Progression Preamplifier is every inch a D’Agostino design. Like the Momentum before it, the Progression avoids negative feedback altoghether. “It is not used anywhere in the Progression Preamplifier,” says D’Agostino, “nor is it necessary.” And yet, this is a very linear, extremely wide bandwidth design. Open-loop distortion is less than < 0.006% and the open loop bandwidth extends to over 100KHz. This would normally suffer from picking up mobile cell phone ‘polling’, but that solid, two-chassis-in-one case prevents RF noise pick-up very effectively. This is similar to the Momentum, just in a chassis that a human can lift without bursting something.